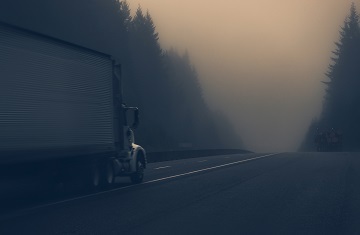 Drivers often experienced limited visibility in adverse weather conditions such as heavy snowfall, downpours, thick fog and blowing dust or smoke. Your responsibility as a safe driver is to know how to adjust your driving to meet conditions on the road. At Tenax Transport, our drivers follow each and every safety measure for a safe driving experience in adverse weather conditions. The most effective defensive driving techniques in bad weather conditions are to slow down and drive at speeds safe for the weather or to delay departure until conditions improve. Before you start a drive, you should clear frost, ice, or dew from all windows. Stop the vehicle on a regular interval of time to wipe mud or snow off your windshield, headlights, and taillights. Also, in excellent weather conditions, drive with your headlights on so as to be seen by other drivers. Heavy snow can decrease visibility because the large white flakes reflect light back towards you. Use low beams in case of heavy snow. In case of fog, turn your fog lights on (but only until you’re out of the fog) and watch out for vehicles that aren’t using their lights. Sun strike occurs when you are driving towards the sun and the sun is lower, keep your sunglasses in the vehicle and windscreen clean. Do not apply brake suddenly. Slow down carefully and gently. In low-visibility conditions, do not change lanes or pass other vehicles unless necessary. Multi-tasking behind the wheel is not a good idea, driving situations can change at any time without warning, so keep your focus on driving vehicle only. If the weather condition is so poor that it would be unsafe to continue driving, find a safe place to get off the road and take some break until the weather conditions improve. Get in touch with the experts at Tenax Transport to get timely updates about more safe driving tips.